For the Italian film, see The Gorgon (1942 film). The Gorgon is a 1964 British horror film directed by Terence Fisher for Hammer Films. It stars Peter Cushing, Christopher Lee, Barbara Shelley and Richard Pasco. Written by John Gilling and directed by Terence Fisher, the film was photographed by Michael Reed, and designed by Bernard Robinson. For the score James Bernard combined a soprano with a little-known electronic instrument called the Novachord. The film marks one of the few occasions when Hammer turned to Greek mythology for inspiration; this time it is the legend of the Gorgon that is respun for the Hammer audiences. The year is 1910. In the rural German village of Vandorf, seven murders have been committed within the past five years, each victim having been petrified into a stone figure. Rather than investigate it, the local authorities dismiss the murders for fear of a local legend having come true. When a local girl becomes the latest victim and her suicided lover made the scapegoat, the father of the condemned man decides to investigate and discovers that the cause of the petrifying deaths is Magaera, the very last of the snake-haired Gorgon sisters who haunts the local castle and turns victims to stone during the full moon. A novelization of the film was written by John Burke as part of his 1966 book The Hammer Horror Film Omnibus. The film was adapted into a 10-page comic strip for the September 1977 issue of the magazine House of Hammer (volume 1, #12, published by Top Sellers Limited). It was drawn by Alberto Cuyas from a script by Scott Goodall. In North America, the film was released in 2008 along with three other Hammer horror films (The Curse of the Mummy's Tomb, The Two Faces of Dr. Jekyll and Taste of Fear) on the 2-DVD set Icons of Horror Collection: Hammer Films (ASIN: B001B9ZVVC), from Sony Pictures Home Entertainment. It is available in the UK as a single disc from the same company. The Gorgon was released in the U.S. on Blu-ray by Mill Creek in March 2018 as a double feature along with the Hammer movie, The Two Faces of Dr. Jekyll. Variety wrote, "Though written and directed on a leisurely note, 'The Gorgon' is a well-made, direct yarn that mainly gets its thrills through atmosphere. The period storyline is simple and predictable but John Gilling has turned out a well-rounded piece and Terence Fisher's direction is restrained enough to avoid any unintentional yocks." The Monthly Film Bulletin found that the monster's appearance was "belated, vague and insufficiently spectacular. Still, it makes a change from vampires, and though the film has little genuine flair for atmosphere it is quite well acted by Richard Pasco and an appropriately blank-eyed, statuesque Barbara Shelley." On Rotten Tomatoes, the film holds an approval rating of 67% based on 9 reviews, with a weighted average rating of 6/10. ^ "The Gorgon". Variety: 6. August 26, 1964. ^ "The Gorgon". The Monthly Film Bulletin. 31 (369): 149. October 1964. 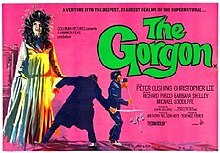 ^ "The Gorgon (1965) - Rotten Tomatoes". Rotten Tomatoes.com. Rotten Tomatoes. Retrieved 25 November 2017.